The squad went into the event with high hopes of gold, but were beaten in a thriller by Nigeria in the last four, despite Paul Drinkhall giving them an ideal start with a 3-2 victory over Segun Toriola. Bode Abiodun came from 2-0 down to beat Pitchford 3-2 and Nigeria moved ahead when Toriola & Olajide Omotayo beat Drinkhall and Sam Walker. Pitchford, 24, revived England’s hopes with a 3-2) defeat of Omotayo, but Abiodun was the hero as he sunk Walker 3-2 in another dramatic match. 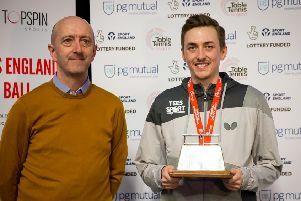 It was a sixth Commonwealth Games medal for Pitchford, who moved level with Andrew Baggaley as the English table tennis athlete with most medals. He said: “It was tough especially to come off after a loss and have to reset and get ready for a bronze medal match. England had reached the semi-finals with routine 3-0 group victories over Ghana and Guyana and another 3-0 scoreline, against Northern Ireland, in the quarter-finals.